As diverse as Spain can be, and considering that every city has its own charm, a stop in Madrid should be on your top list while travelling through the Peninsula. Not only for being the Spanish main city and one of the most Cosmopolitan and culturally active cities in Europe, but also for its wide range of leisure offers to the visitor, especially in spring and summer. Informally known as terraceo, which can be translated as having a drink in a terrace café, this concept has greatly evolved in the last decade with the trend of giving a recreational and cultural use to the rooftops, leading into becoming hip cafés where you can “escape”from the heat of the city in spring and summer seasons. Currently known as rooftop bars, the visitor can look up at the amazing views of the city while enjoying the beautiful and famous summer sunsets in this capital city. This concept has become in one of the favorite hobbies not just for the locals but for its tourists that want to life the truly essence of the city . The Terrace at The Principal modern boutique hotel, with two superb terraces, next to Metropolis building dome. It allows wonderful views of the most iconic buildings in Madrid right above Gran Via Avenue. Probably the best panoramic views over Madrid city center. Why this rooftop? That´s your rooftop if you fancy having a drink in a luxury atmosphere and see the bustle of Alcalá street and Gran Vía avenue. La Casa Encendida. Located very close to Reina Sofia Museum and Embajadores metro station, we find this cultural center. In the rooftop of this building we have “La Terraza Magnética”. With nice views, you can come here to breathe fresh air while enjoying some cultural activity, mainly in summer season. Why this rooftop? That´s the best option for young and energetic people who are looking for an alternative Madrid experience with live music or classic cinema while having a drink. Ginkgo Sky Bar, located in the hotel with the same name in Plaza de España, you will get transported to an exclusive world, with a 360 degrees view and a pool in the 12th floor. Why this rooftop? Perfect to enjoy a nice dinner or having a drink in a different atmosphere while listening to live jazz or Spanish music. It´s rather a restaurant than a rooftop. In the most beautiful at the longest Street in Madrid, Alcalá Street, we find this wonderful building, Círculo de Bellas Artes (Fine Artes Circle). 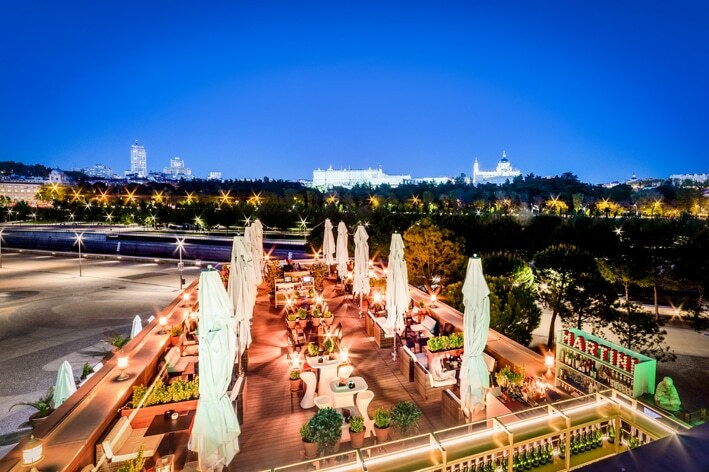 It counts with a privileged rooftop, undoubtedly one of the most popular ones in Madrid. Why this rooftop? The most iconic rooftop in the city. Get your camera ready to take the best panoramic pictures of Madrid. Manzanares river is having one of its greatest times, and to enjoy its amazing views in its streams. Stop by Café del Rio, which is located right next to one of the most amazing bike routes in Madrid. Why this rooftop? Highly recommended if you are cycling around. Live music with views to the Royal Palace. El Paracaidista. Located in what is currently the trendiest neighborhood in Madrid, Malasaña. In here, there live artists, designers and locals who have experienced the gentrification first handed. It allows views to the typical red roofs in this area. El Paracaidista it´s a concept store where you will find a small cinema, café Gallery, design shop, cocktail bar and a restaurant in the rooftop. Why this rooftop? Day or night, this rooftop is a must to have a drink and a snack in a chilled atmosphere if you are in the area. Now, which is your favorite panoramic view of Madrid? Find it out on foot or by bike.